Chiang Mai is one of those places where everyone seems to do a course. Whether it's yoga, massage, Thai boxing or cooking there are loads on offer so you could easily spend a week or more learning new skills each day. Add in the odd mountain biking tour or visiting local waterfalls and temples and you can easily spend your whole holiday in Chiang Mai without even making it to Thailand's famed beaches further south. I arrived in Chiang Mai at the very end of my 9 month trip across Asia. After extending my stay around the islands by over two weeks it was time to see another side to Thailand before the sad return home. 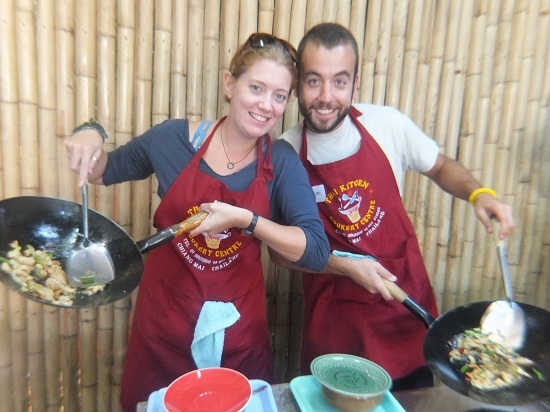 I was determined to make the most of my last few days and had heard Chiang Mai was the place to learn how to cook Thai style. There are so many different courses on offer and I opted for the one that involved making the most in a day and thus eating the most! You might have other priorities but my decision didn't let me down and in a few hours I had learnt how to cook four different Thai dishes and 'how to' eat four different Thai dishes. YUM! I went on a course with the Thai Kitchen Cookery Centre and they picked us up in the morning and dropped us back off at our accommodation at the end of the day. I made a new friend before I even got on the truck and we were cooking buddies for the rest of the day. The first stop was to one of the local markets to buy all our ingredients. The local market stall owners talked us through the different ingredients and we each bought what we needed for our cooking adventures. The kitchen looked like a Thai version of MasterChef with individual cooking stations and lots of small measured out bowls and plates with weighed amounts of different ingredients. We could choose what we made each time and were given a tray with our ingredients ready to chop, dice, slice and cook. It was hard to go wrong; first an instructor would go through the recipe in real time, step by step and then it would be our turn to try our hand at Thai cooking. There were plenty of people on hand to help you out if you had any problems, with the occasional giggle if anyone managed to mess anything up... seriously it was nearly impossible to go wrong. I'm not sure which part of the day I enjoyed the most; shopping in the local markets, cooking exotic cuisines or eating tasty self cooked food. Yes I do, eating it won hands down. I made Pad Thai, Thai Cashew Chicken Stir fry, Chicken and Basil and to finish off the day nicely, my favourite Thai Fried Bananas. After a successful day cooking we were each given a congratulatory drink, a certificate and a recipe book with all our recipes (with pictures) to take home so we can try ourselves without all the pre measured portions and loads of professionals on hand. Since returning to the UK I have tried a few of the recipes I made in Chiang Mai and if I dare to admit it, they weren't half bad. Jen is a freelance blogger and social media expert. She is always looking for the next adventure and her favourite thing to do in any city is wander the streets, stopping at little cafes and chatting to the locals. Jen writes the blog She Gets Around and you can also find her on Facebook and Twitter. If you'd like to have your own foodie adventure in Thailand, take a look at our Thailand flight sale with flights to Bangkok from £463 or direct to Chiang Mai from £618.